Flash email dateline 2 years ago: everybody wanted to do it; no one seemed able to pull it off correctly. Flash email dateline now: see above. It’s been a few years since we took a long, hard look at Flash email, the promises of those pushing rich media technologies, and those pesky little things like "email Clients" or "Firewalls" that seem to get in the way. Flash email is still very much an enterprise-class solution at this point. There are a lot of marketers who say they can design Flash email; there are many who say they can send it. But very few can guarantee that any large group will be able to view or interact with it. 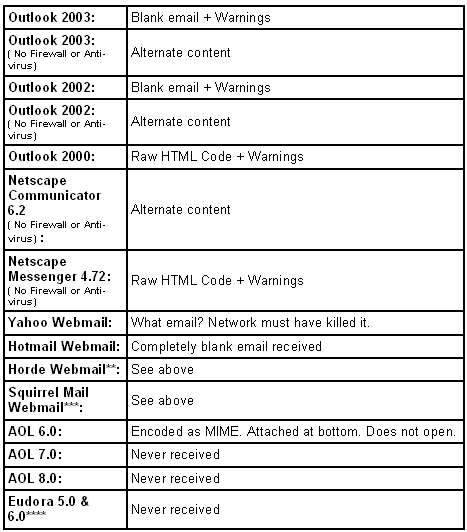 I personally tested almost every demo, sample, preview or other "test" I could find, and couldn’t locate a single instance in which the Flash content showed up 100% correctly in my normal, everyday-use, email client(s) (Outlook 2000 – 2003 and several Web-based email clients as well). Nada. Zero. Zilch. Nothing. I received either garbled content, or "alternate" content such as links, static images or .gifs. So, as you can see, most providers who claim to be able to specialize in Flash email really just specialize in the delivery of alternate content. Anyone can set up a "best case" scenario as a demo. Now, I’m not saying that these providers are not returning value to their customers. However, for the average developer, designer or businessperson who wants to utilize Flash email in some capacity, it really isn’t all that simple. Some of these businesses tout their Flash email solution as foolproof; they say, "99% of all recipients have Flash," implying that 99% of recipients will receive your Flash email message correctly in their email client. However, as we’ll see, this implication is incorrect. **	This is a common "skinned" Web-based email client that is common with a lot of hosting packages. **** This particular client was running "ChoiceMail" spam filtering. That doesn’t mean you should undertake a wholesale abandonment of rich media email, campaigns, or other marketing ideas. What more and more companies seem to be adopting is a hybrid approach to rich media email, and this is where designers and developers can help their clients by thinking more about the message, than the medium. Many of the best practices put forward in the first article on this topic seem to have been adopted extensively by email and Flash email marketers: kudos to you! Just run a Google search on "flash email" and see how many results crop up that utilize the same practices. If you’re designing a Flash email, consider the following points. Use an action, such as a "Click Here" button, to start the Flash email. Start playing the email immediately. Not only start playing the email in preview mode, but play a simultaneous copy when you open the email (the message becomes a wall of noise, and that’s a bad marketing message). Start playing the email, only to have the recipient notice it later, when they’ve missed half the message. A simple "Click here to play this message" can go a long way to preserving your messages’ intended delivery. Animated Gif + Click through to Flash = Effective. Nothing can replace the value of a well-though out and effectively designed dual HTML email and text campaign that combines Flash elements. Why not try an eye catching animated .gif file that has a "Call to Action" that prompts your recipient to click through to your Website? Track it. Study it. Improve it. When did the user grow bored enough to stop the Flash presentation? When did they become interested enough to click through? The Flash movie will play perfectly. The contact and order forms are all set up. The data collection devices are in order. Nothing is left up to chance, or a recipient’s email client. Nothing will "trash" the recipient’s computer or garble the message and associate you or your client’s brand with such errors. Yes, you already know this: stop annoying your recipients with silly, boring, inane stuff. Accept the fact that you can only make the word "Mortgage" stand out so much against the backdrop of everyday life. A text/HTML email was sent; recipients either saw the animated .gif email I described above, or a simple text email that told them about the game. We designed the game so that it was not intended to be played in the body of the email. You cannot control the recipient’s email client, nor should you try to. Our email system recorded the number of opens, clickthroughs, etc. — all of the normal metrics you would expect from an email campaign. The game was played on our Website; a "forward to a friend" feature was located on the Webpage just under the game. The Flash file was encoded with Flash-tracking software that recorded internal metrics, including the number of unique plays, repeat plays, clickthroughs made to our Website, etc. The coupon code was tied into the order system to flag a discount and further track the sale. The game itself contained a coupon for a 10% discount and was designed to present our message to the user as they played. This coupon presented our branding and the idea that working without a contract loses you time, money profit, etc. An affiliate system recorded cookies and server-side tracking for visits and sales. The game was emailed to 12,890 recipients. 4,990 clickthrough to the game. The email was forwarded 512 times. The game was forwarded from the Web page 217 times to 534 people (multi-email fields). Importantly, the game was played 187,900 times. More importantly, the game generated 512 sales, 40 new affiliates, a number of new newsletter signups, multiple business partnerships, new clients for services and an all-round general feeling of quantifiable success. Even more importantly, the game generated brand awareness and sales that we couldn’t completely track: phone sales, delayed sales, sales through affiliates, and so on. This is where you need to be if you do not have the resources to employ an enterprise application for your Flash and rich media email needs. Nothing can replace a well thought-out campaign, offer, or creative piece of marketing. There is no reason why you cannot concentrate more of your time, money, and effort on improving your message and offer, rather than taking a more "flashy" approach.